1934, Paryż, Antoni “Antoine” Cierplikowski. Fotografia ze zbiorów Narodowego Archiwum Cyfrowego. Good morning. Good afternoon. Good evening. I was wondering how I was supposed to say hello to you because I don’t know when you’re going to listen to this particular episode. Some of you prefer to listen to podcasts early in the morning when going to work, others listen to them while doing their morning training, jogging and there are also those of you who spend time with podcasts in the evening or even at night when they are ready with their everyday duties. So, it actually doesn’t matter when you’re going to listen to this particular episode, just stay tuned, enjoy the sounds, the content, the language and simply have a good time with the World of English podcast. So, let’s make it official – hello everybody. I would very much like to ask you to stay in touch with me, to tell me what you enjoy about the podcast, what kind of topics you would like to listen about. I hope you also make use of the transcripts. You can find them at spikkeo.com. And if you don’t understand a word or phrase, you can always download them. There is a glossary with all the words, you can look them up. So, I believe they are helpful. Also, please subscribe to the podcast, your support is an inspiration for me to keep going, to keep on developing and keep looking for better topics, better ideas, for making, generally, the whole broadcast better in every sense. And this time I decided to work on the hair. Well, I’m more than sure that you are very surprised and you are wondering what I’m going to talk about here. Obviously, I’m not a hairdresser myself. Of course, I am a woman. I like to know how to take care of hair, what hairdos are in at the moment, but I have no professional experience in the matter. But still, I’d like to talk about the hair. In a minute you’ll find out why I chose this topic. Obviously, whenever I choose a topic there has to be some linguistic perspective and there is a linguistic perspective here, as well. So, I have noticed some relation between different types of hair and hairdos and other general expressions used in everyday life. And what I’m going to discuss here is how we can use these expressions in some other context, other than the hair. But, let us start from the very beginning. The research that I have done is based on different materials. However, the most inspiring material which I found was an article from the Polish edition of Newsweek, from February 2018. I found an article about Antoine the Paris. And here comes the name Antoine de Paris. I’m sure there are some of you who already know who I’m going to talk about but I’m also very sure that there are a lot of you who have no idea, they don’t have the slightest idea who I’m going to talk about. Antoine de Paris obviously is a pseudonym. A pseudonym taken from French and here I’d like to ask all the speakers of French to forgive me. I have done my best to pronounce it in the proper way, but if I have made a mistake, just let me know. The Polish name of the person that I’m going to talk about today is Antoni Cierplikowski and maybe this name rings a bell. If not, I’ll tell you who he was. So, he was this man from Poland, as I said, who made his name in Paris, in London, in New York, all over the world as a hairdresser and he worked as a hairdresser for over 60 years. Obviously, calling him just a hairdresser is not doing him justice because he was so much more. He was a trendsetter. He was a visionary person. 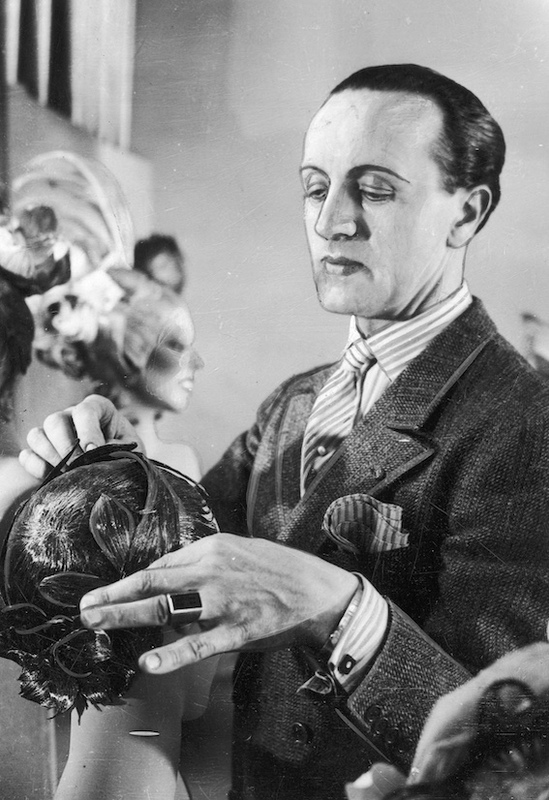 He was this fantastic man who changed the way we perceive the profession today and all the things, really, all the things that we can take pleasure in about hairdressing today they were actually introduced by Antoine the Paris. He cut hair of the most beautiful and powerful women in the world, of queens, actresses, artists. He revolutionized the job of a hairdresser making it a form of art because before Antoine came to the scene, the hairdressing profession was treated as a rather unimportant job. It wasn’t much respected. Well, first of all, it wasn’t much respected because there was no habit of women taking care of their hair. And unfortunately, it’s really hard to say so, although the hairdos actually looked very spectacular, they were dirty and they were kept under these big hats, just to hide them and it was Antoine de Paris who actually let women take off their hats. In the 20th century the hair became as much important as the clothes and this is also what Antoni did, he introduced hairdressing into the world of fashion. So, he’s ideas how to cut hair, how to make proper hairdos, you could put next to the designs of the greatest designers. And if you wanted to be in, if you wanted to know what was fashionable, you had to follow his ideas. So, he became the same kind of person, just like a designer for clothes and the designers were trendsetters in clothes, in clothing and Antoine de Paris was this trendsetter in hairdos. He was a pioneer in the sense that for the first time he cut woman’s hair short, something unimaginable at that time. Also, the places where he worked, because he was the owner of many salons, many hairdressing parlors were a revolution as well because they looked stunning and he invited women for the first time to such places. Before that, and that’s an interesting, I believe, piece of news because before that women hadn’t had the opportunity to go out and had somebody that would take care of their hair, but they actually stayed at home. And women had their hair cut or actually had their hair combed at home. It was the men who actually went out and went to some places to have their hair taken care of, but women stayed at home, and Antoine, thanks to him, he invited women to his parlors. And in the parlors he gave them such a service that we know today. For us it is only natural, right, that we go to a hairdresser, hairdressing salon and that we are given all of these great services, so there is this person who washes our hair, there is this person who combs it, there is this person who dyes it, who prepares perfect hairdos. At that time it was something unimaginable, and I guess that every woman should be very grateful to Antoine de Paris for doing so. He introduced, I use the word introduce a lot, but actually there is so much of a revolution in what he did, in how he worked with women and their hair, that there is actually no other expression to talk about him, because he was such a great visionary, that he introduced so many things into the world of hairdressing. He combined hairdressing with cosmetic service. The woman, as she crossed the door of his parlor, could feel like a princess, and she knew exactly that the moment she entered his salon, she would come back, she would leave the salon looking absolutely stunning, absolutely fantastic. And because of that, because of the cosmetic services that he also introduced Ms Rubinstein wanted to work with him and Elizabeth Arden as well, but, and Antoine was this very strong personality and he refused to cooperate. He wanted to work on his own and all the people of art or fashion, of the cosmetic industry, they looked at him with envy because the way that he was developing his business and the way he was becoming super popular around the world it was a thing of envy for all the people. What is also super interesting is that he introduced the catering service as well into into his parlors because there were served drinks and food. And the food that women wanted to eat, the food could have been taken from some other restaurants, from some other places. So, how else can we call it if not catering? It was indeed catering, a woman entered his salon, when she wanted to eat something, when she wanted to drink something, she just, all she needed to do was just say so, please prepare something for me and they prepared everything for her. So, the who experience in the hairdressing parlor was supposed to be impeccable. The whole personnel was asked to make the client so satisfied that they would bring in her friends and this is an example of the word of mouth marketing. Antoine de Paris was a master, indeed, he did not like marketing in the press or on the radio, but what he believed in, he believed in this good service that would bring in more clients, how clever was that, we know it now, that it works, it does work indeed. But at that time, at the beginning of the 20th century, it was a novelty, another, a new thing that came into the business. Antoine de Paris aroused interest with his outfit, with his extravagant behavior, but at the same time he stayed very well mannered. And this is something that women loved about him, that he looked stunning, he looked impeccable, he knew exactly what to do. They trusted him very much. So, the moment they were there, the moment they entered his parlor, they knew that there was this person who would take care of them and that they needed to worry about nothing. Of course because of that, because of such a development of his business, he was a workaholic also. And the doors of his parlor never closed. Women just came in and out, came in and out, but he also did another new thing for the women, for his clientele, that he could also travel to very far away places. He could travel to houses of his clients and deliver the service there. We know it now, it is only natural for celebrities that they can order some service and there will be people coming down to them, coming to their houses and preparing their hair, the makeup, the nails. Again, at that time, it was a revolutionary idea and if there was this ball in the Opera in Vienna, all the woman had to do, she just had to order, so to say, Antoine de Paris, she just had him to ask him to come. He would come, he would deliver the service and the woman would look stunning. Antoine de Paris was a perfectionist. He never made mistakes. So, this is something I have already referred to, there were no mistakes as regards the proper choice of the hairdo and this is what women adored about him and there was no discussion with him. So, a woman had to trust him and his ideas worked every time, so at least this is what the legend tells us, this is what we can read in the press. The world of fashion owes very much to Antoine the Paris. What he came up with is the nail polishes in different colors, the hairsprays and also the makeup. That information I found extremely interesting, up to then, up to the moment when Antoine came to the scene, makeup had been, so to say, typical of actresses. But, it was not something natural or not something typical for women in their everyday lives, and Antoine de Paris introduced this light everyday makeup. We do it, I guess most women do it, that we put some light makeup after we wake up, but it wasn’t like that in the past and we would need to thank Antoine for introducing this simply. He cooperated with the greatest, with the greatest companies, with the greatest names like Cartier and Dior. He was this owner of over 120 hairdressing salons in the world. And here we come to another business idea of his, to another gimmick, because how else can we call it if not franchising. He owned salons in Paris, and London, in New York, in Warsaw, in almost every corner of the world. But, and here comes the little bit sad piece of news, with his death the brand actually disappeared. And there is a mistake that was made. At the end of his life he had some trouble, trouble in the marriage because there was this great woman behind him, obviously, as we can imagine, and they worked together. She took care of the finances, but they split up, they had their issues, their problems and at the end of his life Antoine made some bad, well, if not bad, but some unlucky decisions and because of this he lost a lot of money and because of this the brand hasn’t been continued. This brand Antoine the Paris is still, perhaps, a bit popular in the United States, but it is much forgotten in Europe. People don’t know it in Europe. And as I’m presenting the story of Antoine the Paris to you, I’m also sure that this name comes as this new piece of information to you as well, although he was this great product, although he was this great man, who revolutionized the hairdressing business to such a way that what we can get today it is actually owed to him. Fortunately, and here comes the positive piece of news, his legacy is still continued, because there is this festival called Open Hair Festival and it is held in Sieradz every year, just to commemorate him and his output and his life. And you can, the people who go there, you can observe the makeovers of different people, you can see how people change, it is to sort of continue his legacy. You can have a look at fantastic hairdos, there are many hairdressers who come to Sieradz just to take part in this festival. There is a monument of Antoine the Paris in the marketplace. So, if you ever happen to be in this part of Poland just step by, have a look and have perhaps a smile on your face because you will tell yourselves, right, we have heard about him and we have heard the story of Antoine de Paris in the World of English podcast. So, I do encourage you to continue with the research, to find out some information, some other information about Antoine de Paris because he was a truly amazing person that seems to be forgotten, at least on this grand scale. Not many people are aware of his existence, and they are not aware of his legacy, of what he has actually done and how much he achieved. And now we’re going to come to the language. I also told you at the beginning of this episode that we are going to talk about language. I’m going to discuss some vocabulary that is typically reserved for the hair. But this vocabulary is also used in everyday context, other context. This is what I love about English, and this is how you are supposed to learn English. So, you need to know that all the words that you actually learn, they have this context, very basic for them, but also there is this other context in which you can use them, and if you get to know that, believe me, you will develop very fast. I mean, you will develop linguistically, so please do not learn only the very basic structures, but also think how you can apply these structures in some other context. The most obvious expressions that can describe hair, are the adjectives long and short. Obviously, I’m not going to tell you how to use it in some other context, other than the hair, because it is obvious. There are other things that can be long and there are other things that can be short, people are also short. So, please remember when you’re talking about the height of somebody then you call this person a short person. But I have prepared some other expressions, expressions that, maybe, are not that very popular and in this way you can learn them. So, you can have spiky hair. And spikes, they are those little things that you can find on a cactus, and that’s why we call hair spiky because somebody with spiky hair looks like a cactus. But the word spiky can also apply to heels. I know there are women, and I am one of them, who like high-heeled shoes and there are those special types of heels because they are called spiky heels. Another name for the hair, for the hairdo is perm. Perm is used for short, and a fuller version of this expression is permanent wave. Permanent wave was something that was in and that was very popular in the previous century, I’d say, I don’t know, maybe it is still in or it is getting popular because I know that hairdressers nowadays that they can use all sorts of inspiration from different sources, so they can even take from the 80s, from the 70s, but that was a time when permanent wave was very popular. Let’s look at the word permanent. So, that’s not only applied to the word wave, but it can also apply to business expressions. Like, we can have a permanent contract and a temporary contract and these expressions are used every day. Different people use it because they have different types of jobs. Some of them have this permanent contract and others have the temporary one. Permanent obviously means that you start working for a given company and you can work there for life basically, but if it is a temporary contract it means that it will expire some time later in the future. A bun. I don’t know if you like buns. I mean this type of hairdos, round type of hairdos. I can apply this word also in the food industry and that many people eat buns, especially, when we associate buns with hamburgers, because this is a small sweet cake or a small round type of bread. And this is exactly how we get our hamburgers. So, most hamburgers come in buns. Straight hair. That’s another type. Straight it means that there are no waves. There are no curls. Definitely, there is no permanent wave and the expression I’d like you to remember here is straight from the shoulder. If you say things straight from the shoulder, it means that you say what you want to say in a very direct way, not even trying to be polite. So, you do not beat about the bush, so to say, but you just say ok this and that, I don’t agree. I don’t like it. And you don’t even want to sound polite because what you want to do is you want to get the result, you want to inform the person straight from your shoulder. One of my favorite expressions, that’s another one, is the word fringe. There are women who like fringes and there are women who avoid them. When I think about myself, I had different hairdos, I have had different hairdos in my life. So, they were fringes, there were no fringes, fringes of course make a woman look young and sweet, and a fringe covers the forehead. And the context that you can use the word fringe in, other than the hair, is to infringe the law. So, it is legal English. Of course, you need to add the in at the beginning, the prefix in, because as I pronounce it, as I said it, it’s infringe the law, you know very often this basic expression is break the law. So, that’s the synonym of it. You break the law or you infringe the law, but now you know that you can use some other expression and you can sound a little bit more sophisticated with the word infringe. The final expression for today would be highlights and highlights are these little pieces of hair that you can have in your hair that make it look as if there was sun that made it look this way. So, this way I very much like it, this look and it looks absolutely beautiful, especially in summer because it does look like there was some sun involved. And the other context for the word highlight is that you can highlight something, you can emphasize something, you can stress something, so you can tell the people, you can inform the people that something is very important for you, so you can highlight some information. I hope you find this piece of information useful. I hope you will remember some of the expressions and now it will be easier for you to read an article or listen to some real material because you understand more. I also hope that this piece about Antoine de Paris was interesting for you, you found it gripping, interesting. For me, just to sum up, he was this great person, a great character, a great product of Poland and it’s a pity that for some he has been forgotten. I hope I have made him a little bit more popular, and I hope you have enjoyed this particular episode. So please come back next time. et’s stay in touch.